We're just back from a holiday spent in Los Angeles visiting friends. 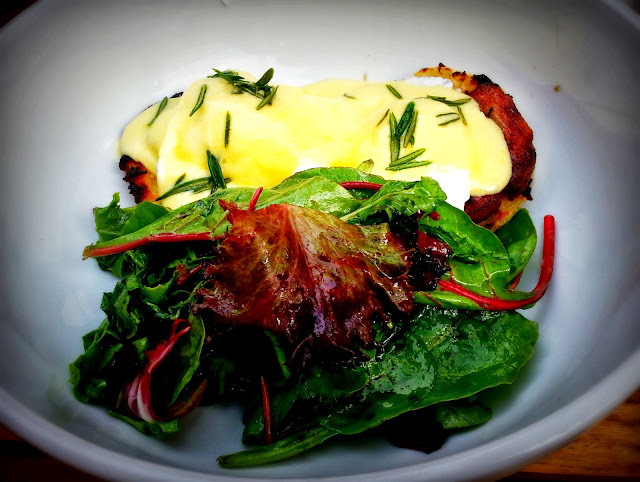 We had some great food, but the dish that I am still fantasizing about was actually a humble brunch pastry. Sycamore Kitchen comes from the chefs behind the well regarded Hatfield's. It opens nice and early (perfect for a baby on East Coast time!) 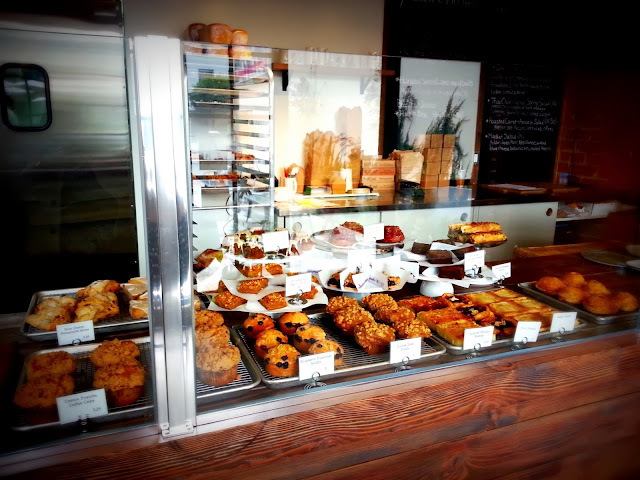 and offers an array of pastries and brunch dishes. The pastry that stole my heart was a salted caramel pecan babka roll. I would normally not order a sticky bun, but the salted caramel, the flavor combination du jour was too compelling to pass up. I LOVED this roll. Seriously, I might have to cheat on my beloved chocolate banana pancake to take up with this ooey gooey salty goodness. It is simply the perfect combination of salty and sweet. So good in fact that we returned the next day so I could eat it again, and the second time I didn't even share. If sweets aren't your thing, everything else at Sycamore Kitchen is ridiculously good, too. I'm not exaggerating when I say that every bite of everything I had was utterly scrumptious. 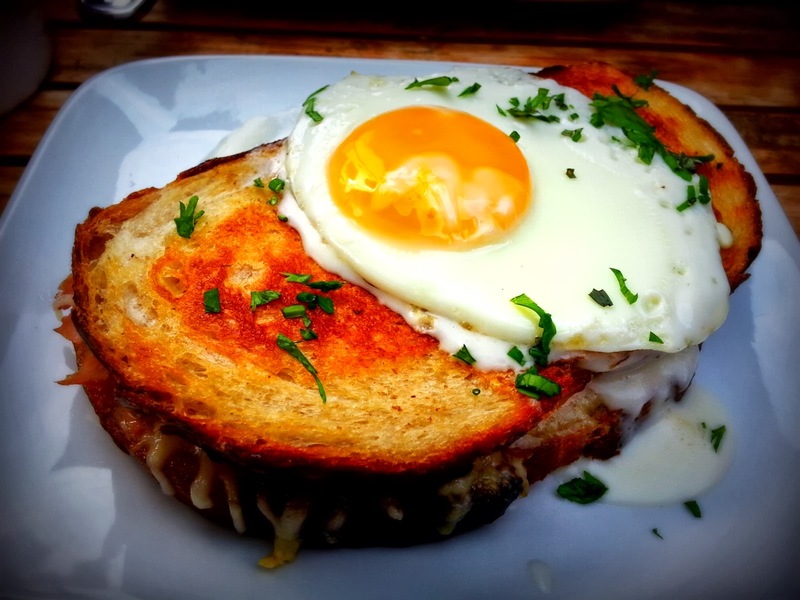 The croque madame combined ham, cheese, béchamel and an egg on wonderful grilled country bread to great effect, and the eggs benedict was taken up a notch with the addition of honey-sherry glazed pancetta and fried rosemary. On our return visit, I tried the scrambled egg and chorizo sandwich with melted Swiss cheese, roasted onion, on griddled pan de mie. To be honest, I thought this would pale in comparison to the previous day's dishes, but I didn't want to order the exact same thing. Well color me surprised, it might have been even better than the other two dishes. Or maybe they were all equally delicious. Tough to say when my brain is melting from overwhelming pleasure. Our friend ordered the granola both days, so it must be good, but I could not possibly resist the siren call of less healthy fare. Probably that is why he has Hollywood good looks and we look like regular people, but it's totally worth it. Shoot, now I'm sad that I won't get to eat this food again any time soon. I'm usually somewhat ambivalent about brunch food, but this was the business. Can someone in Atlanta pretty please begin making a salted caramel pecan babka roll? Add to that a pleasant outdoor eating area, low humidity 70-something weather, Stumptown coffee and dog friendly dining, and I was in heaven!